This isn't your father's Rolls-Royce. Rolls-Royce, known as the ultimate luxury car, is tired of playing Mister Nice Rich Guy. The staid British automaker unveiled new, darker, Black Badge versions of its Ghost and Wraith cars at the Geneva Motor Show, which sport a much more sinister look. The RR letters on the badge are silver on a black background, the reverse of the standard badge. The famous chrome Parthenon grill is a darker, smokey hue, and even the Spirit of Ecstasy statue that stands atop the hood is coated in ash-colored metal. These new cars are designed to appeal to "generation of young, self-empowered, self-confident rule-breakers," who, Rolls-Royce says, are attracted to the brand's cars but want to set themselves apart. 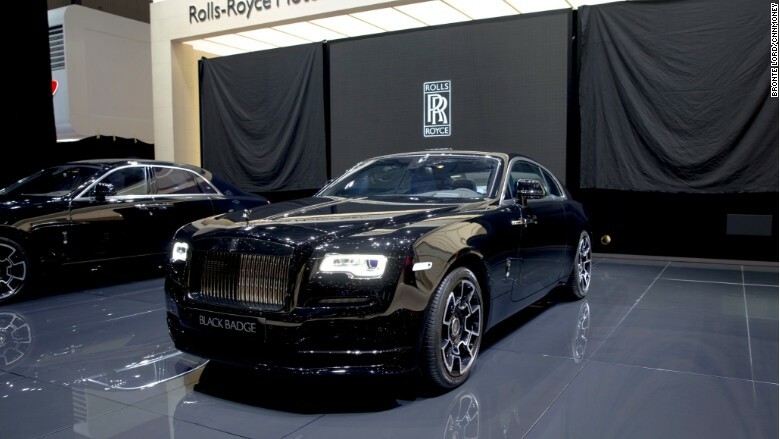 Rolls-Royce's Black Badge Ghost on display in Geneva. The Black Badge treatment will only be available on Rolls-Royce's Wraith sedan and Ghost coupe models, both of which are smaller and more performance-oriented than the brand's larger Phantom-series cars. Rolls-Royce said it has no plans to offer the Black Badge treatment on the Dawn convertible, which is closely related to the Ghost and Wraith. But that could change depending on customer demand. The Black Badge cars will have some performance upgrades to go along with their meaner looks. The Black Badge Ghost's V12 engine will be modified to produce 603 horsepower, 40 more than an ordinary Ghost. The transmission will also be programmed for more aggressive performance. The two-door Wraith's V12 already produces 623 horsepower, more than enough for a Rolls-Royce. So, instead of adding more horsepower, the Wraith Black Badge's has been altered to provide more torque, pulling power available at low speeds. It will also have sportier suspension and even more aggressive transmission settings than the Ghost Black Badge. Aside from the dark chrome upgrades, Black Badge buyers will be able to choose whatever interior and exterior colors they like. Prices will start at about $350,000.